I am a firm believer of the saying “one person’s trash is another person’s treasure.” This past weekend, a near-by college held its annual Trash to Treasures sale. It sold all the items that students left in the dorms, and all proceeds went to charity. 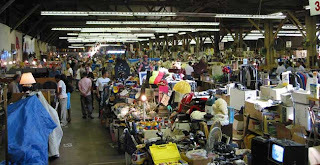 I found some great items all for affordable prices. I found a barely used pair of Nike Air shoes for $5, and I got two five-subject notebooks for $6. It was a nice feeling to save so much money on things that I need. I also got tape, glue sticks, and a cool poster showing the construction of the Eiffel Tower. When going to a large flea market, make sure to get there early. Some of the great stuff might go fast! Going to the sale late, however, may be an advantage too. The prices may go down for sellers desperate to get rid of their things. Besides, everyone has different tastes, so the dress, shirt, or table you’ve always been looking for may still be there and have a more affordable price. Check to see if the clothing has any rips or holes in it and whether or not it is easy to repair. If you think it “could” be repaired, then make sure it’s a reasonable price, so if it can’t be fixed, you don’t feel guilty throwing it away. You may need that scarf or that belt that will work perfectly for your outfit, so keep that in mind. You may come up with the best outfit ever! You don’t know where that shirt or dress has been. Keep in mind that it may smell like the users. I bought a shirt at a flea market last year, and the previous owner wore this really strong perfume. I had to wash it so many times until it was finally gone. Lucky for me, it wasn’t a bad smell. I am a big fan of crafts and love to decorate things I find. Keep your eye out for a chair that can easily change its cushion pattern, or a table you can paint or decoupage. For some ideas or inspiration, check out the website Design Sponge.